In order to make a fully informed decision, having easy access to valid, research-based information is key. Working hand in hand with clinicians who volunteer with Saving Our Sons, we deliver accurate prepuce ('foreskin'), intact care, and circumcision information to any expecting parent or clients of intact conscious practitioners. There are 6 options below for getting material to your expecting friends and family members. 80 pages of articles and research. This material broaches a wide range of sub-categories within intact literature, and responds to all major myths regarding the prepuce, intact care, and circumcision today. Complimentary videos on DVD full of helpful, research-based information on the prepuce, its care, and the circumcision decision parents in the U.S. and Canada are allowed to make today. A proper intact care card and sticker for use at a physician's office, daycare, nursery or with a babysitter. We are happy to send along additional intact care cards or stickers at your request. These are 2-sided, full color, glossy, and made with heavy card stock so they can be reused (or laminated and kept handy with your baby's diaper bag). 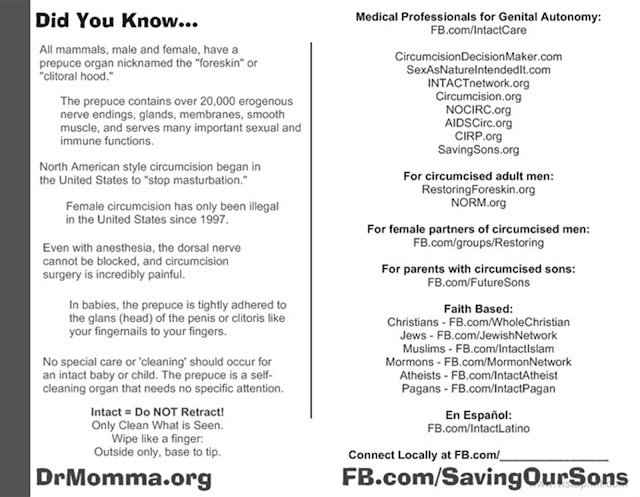 A National Medical Organizations Statements on Circumcision chart that highlights positions on infant circumcision from a variety of respected groups around the world including those in the U.S., Canada, U.K., Australia, Finland, India and others. 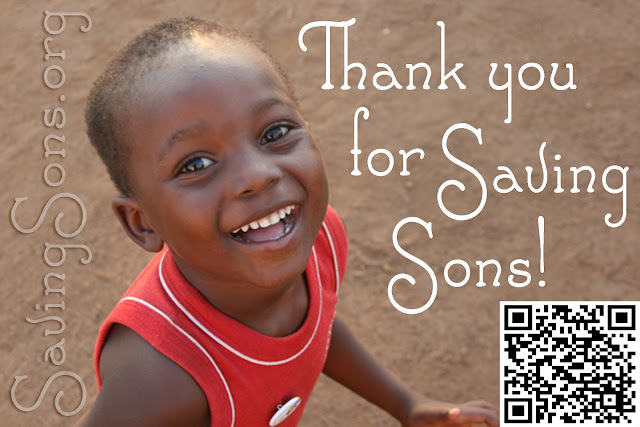 A Keeping Future Sons Intact card especially for parents who may already have a son who was circumcised. This does not mean future sons cannot remain intact. Many families are raising both circumcised and intact sons, and we hope to support parents in this change of heart. A "Did You Know?" card full of quick facts about the prepuce, intact care, and circumcision in the U.S. and Canada. A "Babyface" postcard that contains quick facts on the prepuce, intact care, and circumcision, as well as a full list of websites by subject for doing additional research on the topics of circumcision, intact care, and restoration. An "Expecting a Boy?" 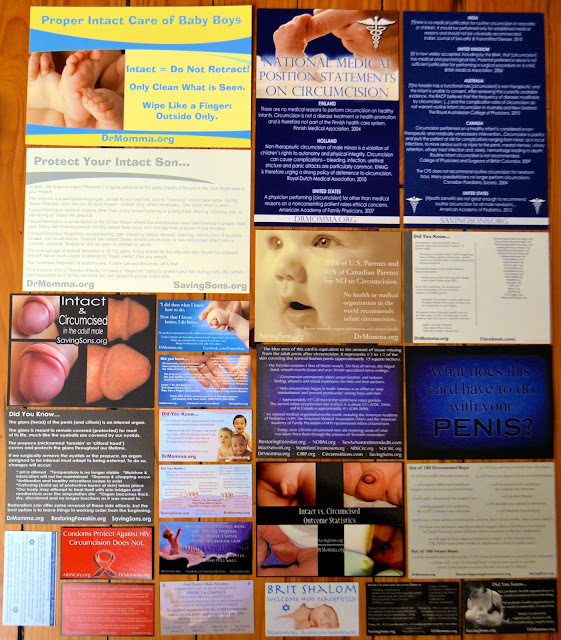 postcard that contains quick go-to resources on the front; circumcision and intact care points on the back. A "Trust His Body" postcard that serves as an encouragement to parents of the perfection with which their son arrives. The back has the functions of the foreskin and intact care information. An "Intact vs. Circumcised Outcome Statistics" postcard that highlights the difference between an intact and circumcised newborn baby; shows a photo of what a circumcised infant looks like both from Plastibell and Gomco clamp, and lists statistics and risk factors both for keeping babies intact, and circumcising. An "Intact vs. Circumcised Adult" postcard that specifies the way the glans must change from being an internal to external organ when circumcision is carried out. This card is also includes restoration information for men who may want to look further into this option. A "Lost/Found" card that has quick-facts on the functions of the foreskin on one side (things that are lost to circumcision) and the things found with restoration on the back. This card is especially for fathers who may feel their son should 'match' them. A "Restoration" card that has go-to resources for men who may have been circumcised at birth, as well as the large variety of restoration devices available to men today. A "Breastfeeding/Circumcision" info card that points out the many ways that circumcision can hamper a successful breastfeeding relationship. A "Congratulations!" card with a wide variety of discussion groups on various topics parents may be interested in (everything from pregnancy, birth, breastfeeding, babywearing, cloth diapering, gentle discipline, raising girls or boys, etc.). An "Elephant in the Hospital" sticker. Dr. McAllister's entire Georgetown University lecture is included on the DVD with this pack; the sticker is added as an extra encouragement to spark interest and move parents to check things out. [Optional] Added faith-based information that is relevant to families who are devoutly Jewish, Christian, Muslim, Mormon, or Catholic. Please include a note when ordering or email SavingSons@gmail.com for faith-based items to be added. [Optional] An "HIV/AIDS and Circumcision" card stressing facts that relate to the 2006 HIV trials in Africa, and the myths that have surfaced from those trials in U.S. media. Calmoseptine samples: This ointment is the top recommended for use on developing skin. It does not interfere with a baby's natural pH or healthy (protective) microflora, and is perfect for use on babies during diaper days, when irritation or redness is common. It is the most recommended cream by pediatricians volunteering their time with Saving Our Sons, and is the cream we use when leading intact care classes. Calmoseptine can be purchased at most pharmacies around the world, or on Amazon. Contact information for Saving Our Sons and The INTACT Network volunteers, and follow-up with families who may have additional questions, or wish to talk with an intact friendly physician, educator, or other parents in their local area. Each of the items in the SOS info pack has been specially selected by a board of individuals who have served in the professional fields of pediatrics, human sexuality, development, birth and education over the past 35 years. Our pack serves to empower parents in making a fully informed decision for their son before birth, and equipping parents with necessary resources for proper intact care after birth. The SOS info pack is perfect to share with friends, family and parents (or parents-to-be), as well as for birth and baby educators, midwives, doulas, and medical professionals to lend to expecting clients. Information packs are $16 total (no profit is made on these items). $12 goes to printing, materials, and supplies; $4 to ship (U.S.), $7 (Canada), $8 shipping to other international locations by weight. If you donate more than $16, the remainder will go to help other families. Be certain that your name and mailing address are correct when requesting via PayPal, or email SavingSons@gmail.com separately with mailing information. If you are able to sponsor an info pack for another family, or help us attend the next maternity expo, please visit the sponsor page. NOTE: Info packs have updated cards compared to those pictured above. New items will be included. (minus the Christian and Jewish themed cards which are only included upon request). View each closely on the info cards page. The Expecting? 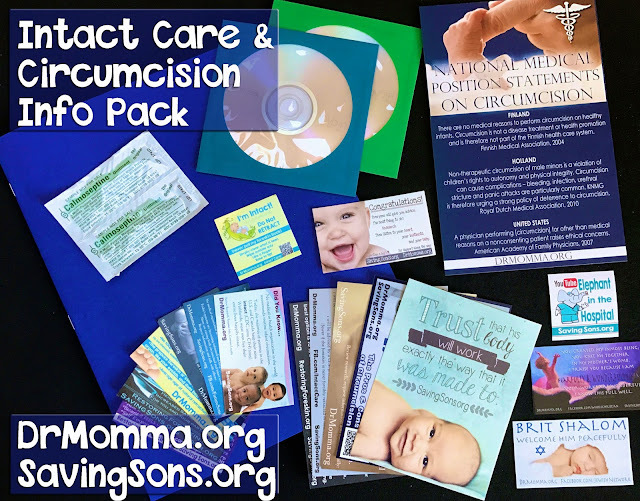 combo packet of informational items is significantly smaller than the full circumcision info pack (no DVDs or full articles), but is perfect for sending to any and all expecting friends/family. Materials are professionally made and serve to plant seeds of information on each of the following topics: circumcision, intact care, breastfeeding, babywearing and healthy baby sleep (i.e. no 'cry it out'). These items are mailed directly from Peaceful Parenting and include a thorough amount of material on circumcision and intact care, while at the same time covering other parenting topics that will impact a baby's life. 'Keeping future sons intact' themed info is included to ensure those who may already have circumcised boys find they have community and can be empowered to make a different decision the next time around. The Expecting? pack can be mailed anonymously - simply include an individual's name and address for shipping, or email SavingSons@gmail.com with this information. Indicate if you would like additional Christian, Jewish, Muslim, Mormon or Catholic items added to the pack. For clinicians may be requested here: SavingSons.org/2015/07/retracting-clinician-information-pack.html or by clicking the Don't Retract Pack tab at the top of this website. The Breastfeeding Mom's Info Pack was created to send to an expecting mother who plans to nurse her baby, in situations where you'd like to give her something to meet her needs, plant seeds of intact info, and encourage her in the gentle care of her baby on the way. The Expecting a Boy? postcard (with care information on the reverse) and Babyface postcard (with quick facts and resources on the reverse) are sent in a blue envelope to your expecting friend/family member. Your friend will have our contact information for further questions/dialog, but this will be anonymous of who requested (unless you wish to be named, or include a note with the postcards). Be certain your friend's name/address is included in a note, or email SavingSons@gmail.com with this information. $1+ donation to help cover postage. Information is almost always best received by professional materials in-hands. This sparks further curiosity in a way that leads people to investigate more deeply. The next best thing if you cannot get materials into someone's hands is to email or message them yourself with 1-2 quality links that lead to more information. The resource page at SOS is an effective starting point that has saved many babies: SavingSons.org/2014/12/should-i-circumcise-pros-and-cons-of.html It is also the landing page if you only share the SOS website (SavingSons.org). If you're unable or do not wish to email or message on Facebook yourself, email SavingSons@gmail.com and we will respectfully message your friend, anonymous of who requested. We send one copy of the Expecting a Boy? postcard via email (pictured above), as well as 1-3 quality links that will lead the reader to further information, and are specific to that individual's family/faith/location. Saving Our Sons messages are professional, courteous, and we will get information to your friend/family member and answer any corresponding questions. We will not pester, harass or otherwise bombard your friend.